Concerns over anti-doping inspections on stud farms, as well as inspections from the Workplace Relations Commission (WRC), were hot topics at the Irish Thoroughbred Breeders' Association seminar at the Minella Hotel, Clonmel, on Friday. Breeders have to contend with the prospect of inspectors from the WRC, the Department of Agriculture, Food and the Marine and the Turf Club's new anti-doping unit, and worries over these visits and the issues surrounding them formed the main thrust of the questions put to the panel. Dr Lynn Hillyer, the Turf Club's recently appointed chief veterinary officer and head of anti-doping was joined on the panel by Dr Hazel Sheridan from the Department of Agriculture, Food and the Marine to answer concerns about issues of anti-doping and the legislation governing the administration of medicine to horses. The prospect of anti-doping tests being carried out on stud farms and at sales forms part of an ongoing discussion between the Turf Club and breeders, sales companies and other stakeholders, Dr Hillyer confirmed. "We are talking with the ITBA and others in regard to testing on stud farms for prohibited substances," she said. "These substances are on the World Anti-Doping Agency's list of drugs prohibited at all times and they are drugs that have no place in breeding or racing. They are the real nasties such as EPO and growth hormone." The Therapeutic Use Exemption (TUE) for anabolic steroid administration to bloodstock is an issue of contention for many and discussions are ongoing between Dr Hillyer's team, the ITBA and others on the matter. Notice periods for inspections, the methods by which studs are selected for inspection and applying the rules of racing to drug testing bloodstock are also being discussed. "Our intention is not to test breeding stock, it will be foals and yearlings only," Dr Hillyer said. "The tests will probably be carried out by me on the stud farm and if our analysts detect substances from WADA's prohibited substances list, if there is evidence of illegality it is our duty to pass on the information to the department." Dr Sheridan, was grilled by breeders about department legislation regarding medication and inspections of premises. "If it states on the data sheet that comes with a medication that it is a veterinary practitioner-only product then that medication can only be administered by a veterinarian," she emphasised. "It is a legal requirement, as is the proper and appropriate disposal of medication. Our investigations team has the power to enter premises where authorised officers believe there are medicines, or animals that have been administered medication, on that premises." 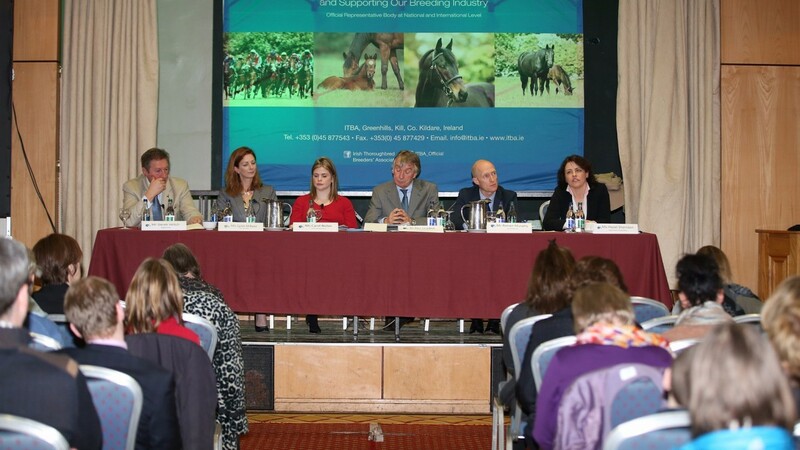 Carol Nolan, director of people and industry education for Horse Racing Ireland, outlined the employment laws that apply to stud farms and what employers need if they are inspected by members of the WRC. "The WRC has indicated that they are interested in looking into the racing and breeding industry, along with fisheries this year, but there is nothing for us to be fearful of," Nolan reassured breeders. WRC inspectors are most concerned with ensuring stud and stable staff are paid appropriately, that stud owners keep proper employment records and employees receive the proper leave and have the breaks and working conditions they are entitled to. "The ITBA has come up with a checklist for breeders so they can ensure they have all the relevant information at hand should inspectors call," Nolan explained. "Sometimes you will get notice, and other times inspectors will call unannounced. The employer should provide the inspectors with as much information as possible but they will give you a timeframe for giving that information, particularly in the case of unannounced inspections. "They will talk to employees and can even write to them as well."